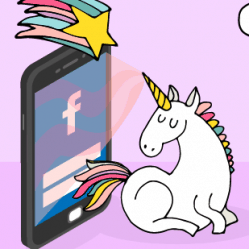 When you fire up a new ad campaign on Facebook, what’s your first move? This new format is converting extremely well and send-to-Messenger ads only take a few minutes to set up. Here are a few Facebook Messenger templates. 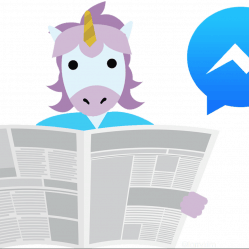 What Are Facebook Messenger Ads? Why Should You Use Them? 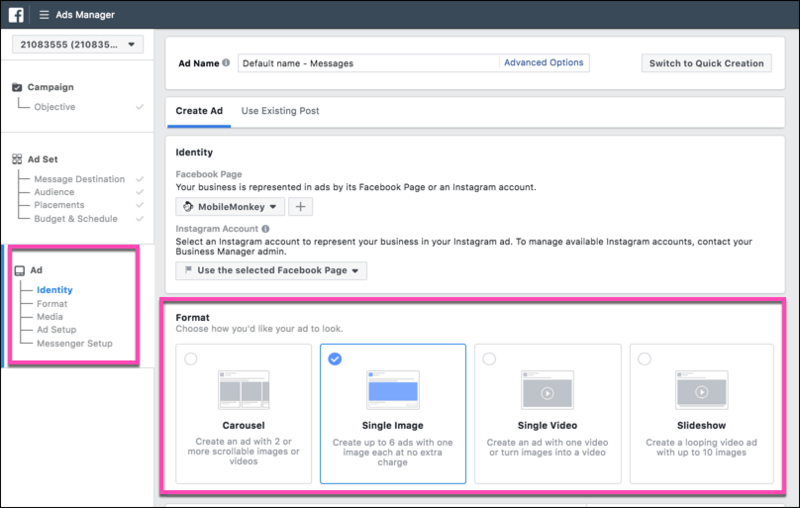 To demonstrate the ad setup, we’ll create Facebook ad together in 4 steps. See the Facebook Messenger ad we create together here. You want more leads, sign-ups, downloads, sales. You need to keep feeding the marketing engine. So you head to Facebook to craft some compelling ads to a targeted audience. What’s your first step in creating an ad? When most turn to Facebook to promote content or drive traffic with ads, they pick “traffic” or “engagement” from the menu of choices. If you normally pick one of these as your ad type, don’t feel bad. It’s completely normal, and sometimes you can even get results with these types of ads. On your own Facebook News Feed right now, you’ll likely see a dozen ads using these same objectives. They focus on driving traffic to a website or engaging with a piece of content on Facebook. And on average, they get a 2% conversion rate for advertisers. Hold up. Two percent conversion rate?! That’s a load of donkeys. Settling for conversion rates that low isn’t moving your proverbial revenue needle. Average costs are high. Conversion rates are low. Ads aren’t engaging. What worked once doesn’t work anymore. That’s the way of the digital world. This crazy-looking ad achieved a click-through rate of almost 80%. Yes — something that simple, broad, and wacky generated engagement levels that would be unheard of today. The average display network CTR is now less than 1%. As a marketing channel ages, ad fatigue sets in and the ad format becomes less effective. Which brings us back to Facebook Messenger ads and how they’re driving conversion rates higher than that HotWired ad did when banner ads first existed. So what exactly are Facebook Messenger ads? How, when, and why should you use them? Part 2: What Are Messenger Ads? Why Should You Use Them? How many times have you seen an ad on Facebook with the CTA button “Send Message”? Maybe once or twice while scrolling your News Feed? Messenger ads are pretty rare on Facebook right now. 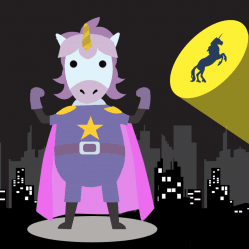 And rare yet engaging formats are the best for producing unicorn engagement and conversion rates. 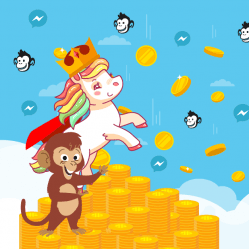 In fact, MobileMonkey users have been able to produce 100% conversion rates by using send-to-Messenger ads. Every click on the “Send Message” button can yield a new lead. How? Every time someone engages, they send a message to your Facebook Page inbox which allows you to message them later on without paying for continual ads. 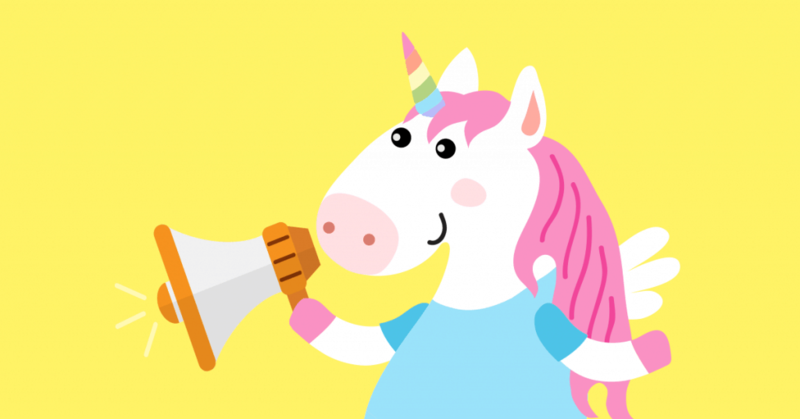 These send-to-Messenger ads work just like normal ads on a Facebook feed except for the fact that they utilize Messenger to drive the engagement and lead generation rather than hoping for a conversion on your website. Messenger ads and the Messenger user experience is the ultimate in mobile friendly. Mobile optimization is arguably more important now than ever before. And that means that you need a site with a fully-functioning mobile-first design to really see big jumps in conversions. But developing a mobile-first design is expensive and time-consuming. Typical mobile landing pages are donkeys. But Messenger is always perfectly optimized for the mobile experience, and users can get fast information on the go through conversations rather than forms. Messenger ads produce contact info with a 100% conversion rate. When a user clicks on your CTA to message you, they have opted into Messenger, even if they haven’t directly given you an email yet. You can now message them at a later time on Facebook Messenger without paying to contact them again. Meaning you’ve just landed them on your Messenger list and eliminated any need to pay to message them more. This opens the door for tons of future drip marketing campaigns with Messenger. Messenger ads cost per lead is a tenth of the cost of traditional Facebook ads producing 2% conversion rates. Take a closer look at this Facebook Messenger ad case study we did. We averaged $3 to $4 per click from Facebook ads directing traffic to our site. With a 2% conversion rate of website traffic, each conversion was achieved for $150 to $250. We switched to click-to-Messenger ads exclusively, where each new Messenger contact is $3 to $4. 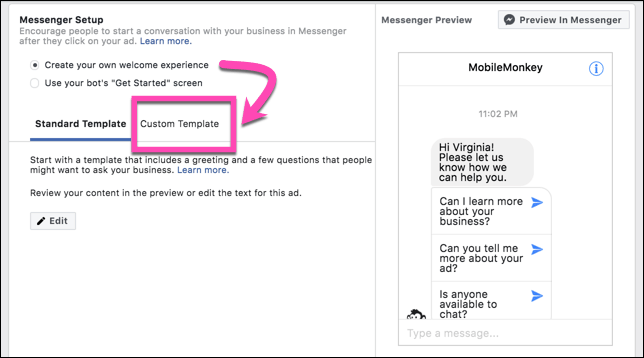 Now that we’ve answered the question of what are Facebook Messenger ads, you’re ready to set up your first “Send Message” ad on Facebook. 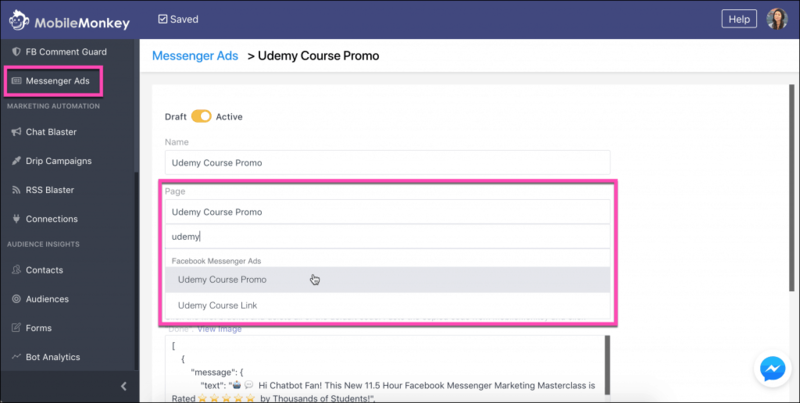 Here is a step-by-step guide to getting started with Messenger ads. 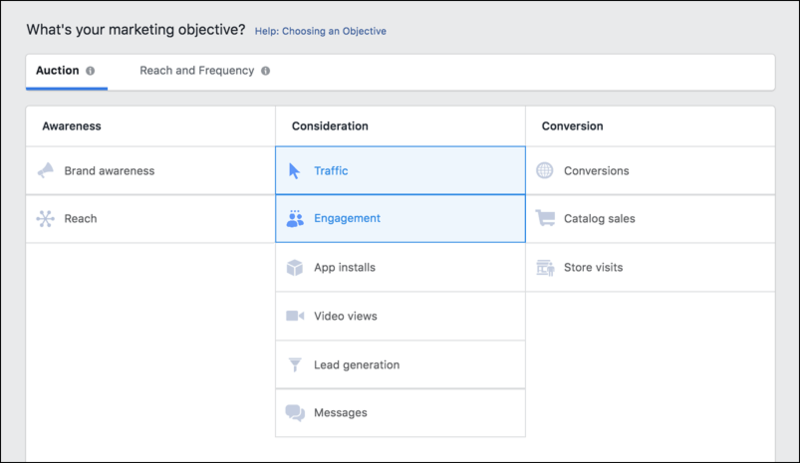 Setting up a “Send Message” ad on Facebook is the same as your traffic or engagement ads in setting up the creative and audience optimization and targeting. 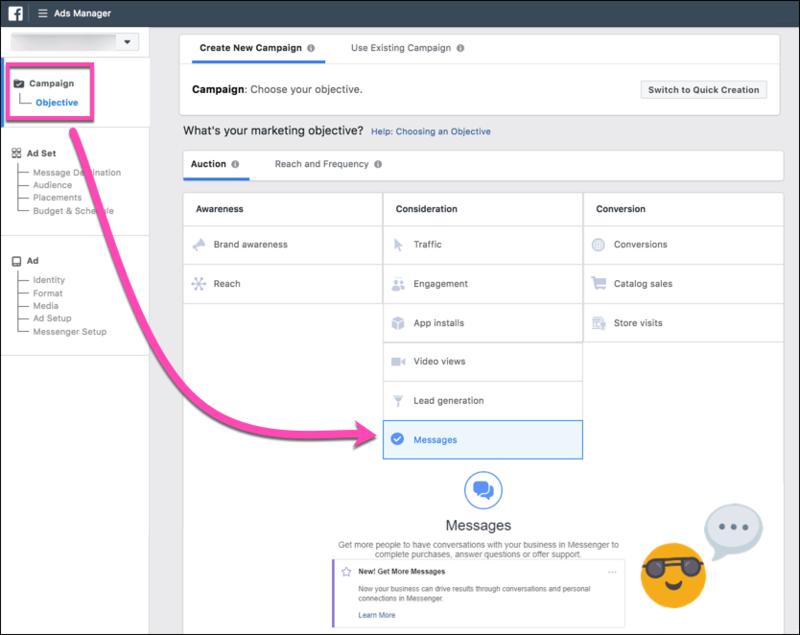 Here are the first three steps of creating a Facebook ad so your audience starts a conversation with your business in Messenger and you gain a new lead for follow-up messaging. First, you’ll start a new ad with the Messages objective. Then you select your target audience. And then you get to work building your ad creative. In the following Part 4, we’ll add the MobileMonkey Messenger chatbot to the ad. That’s where the bot-o-mated magic happens. 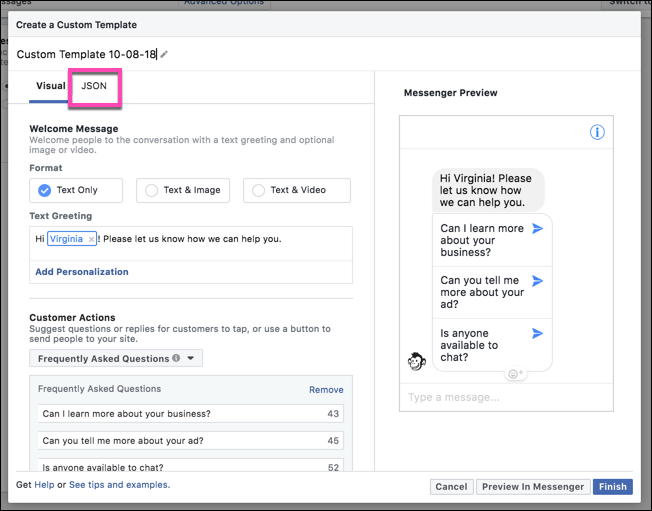 Message Destination: The default message destination (where your user will message your Facebook page) will be “Click to Messenger”. You can also choose “Sponsored Message” from the drop-down selector, which will allow you to send a promotional message to your existing Facebook Messenger contacts. For a messages ad campaign attracting new leads or contacts, stick with “Click to Messenger” for the destination. Audience: Define who you want to see your ad. Choose an audience you’ve saved before or create a new audience, whether a custom audience of contacts you provide or that have engaged with your website or page, connections to your page, or interest, behavior or demographic based targeting. Placement: Choose where your ad will be displayed among Facebook’s ad network. 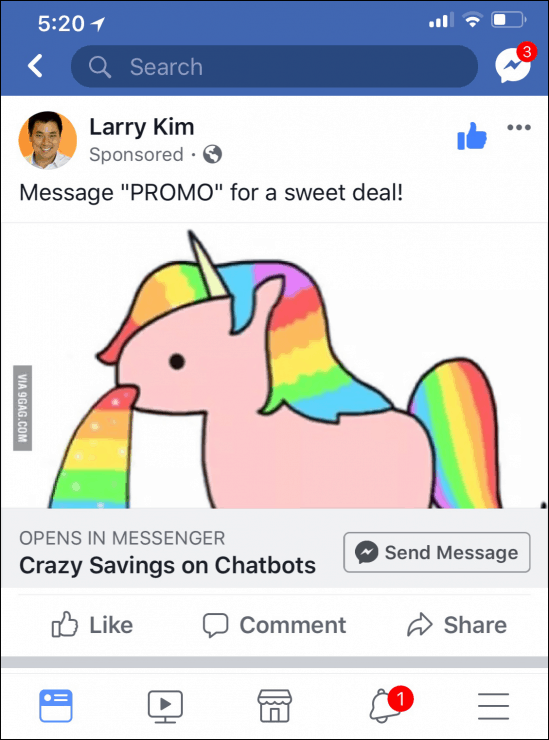 Facebook messages ads can be displayed on the Facebook News Feed and within Facebook Messenger as well as the Instagram feed. Budget: Define how much you’d like to spend, whether daily or for the lifetime of the ad campaign. Next up, design the ad creative that users will see in their Messenger app, Facebook or Instagram feed. You can choose from the standard formats you’re used to: Carousel, Single Image, Single Video, and Slideshow. After you upload your ad media, enter the ad text, headline and description. Choose the call to action label for the button. By default, Facebook sets your call to action button as “Send Message”, and you have additional button CTA options if you want to test them out, from “Contact Us” to “Subscribe”. 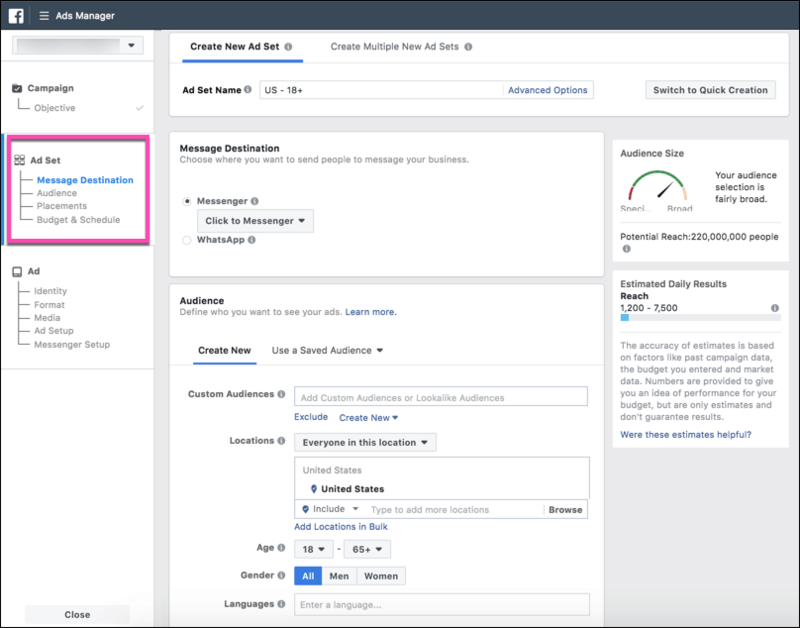 If you were to publish your ad now, people who click your ad will land in your Facebook Page inbox, and you can have a person respond to each and every message. Orrrrrr… you can set up a chatbot to automatically respond to messages from people who click on your ad! Individual, tailored, and scalable! Now that’s that power of chatbots. Here’s how you combine Messenger ads with MobileMonkey chatbots for automation efficiency that scales with no limit to business growth. 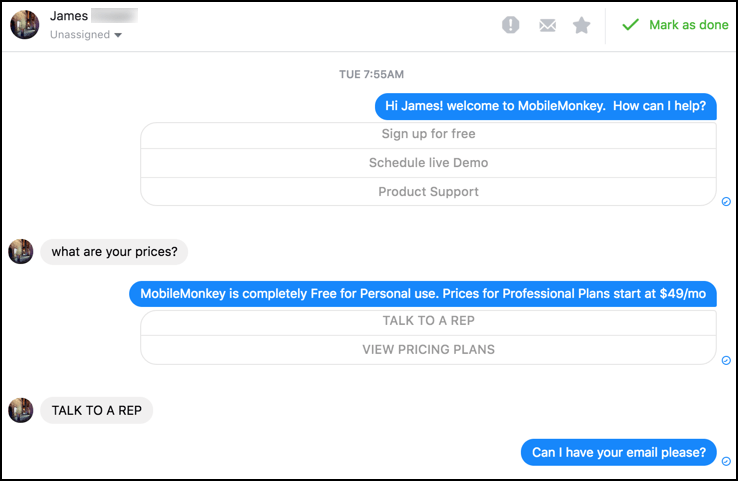 With MobileMonkey’s free chatbot builder, you can create chatbots to respond to your Messenger ad, matching the message, offer and audience. To build the chatbot that responds to users clicking your Facebook ads, we’ll use the visual chatbot builder. 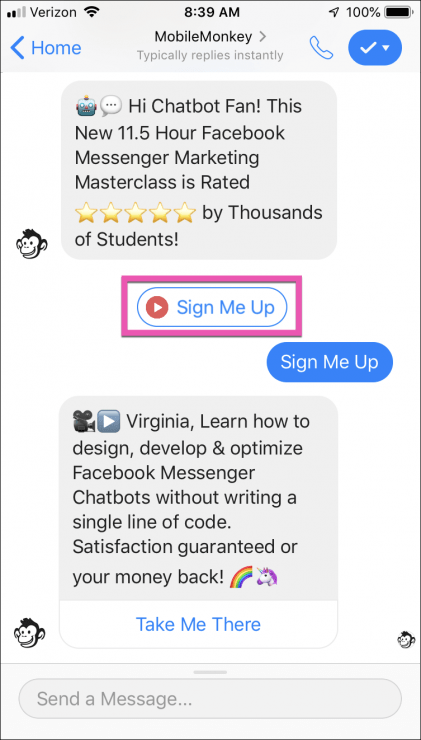 If you’re looking for a closer step-by-step of how to build a Facebook Messenger chatbot, start here. You’re going to create a new page within a new or existing group, and use the widgets to add content to your page. The Quick Question widget is the key to Facebook Messenger ads because they give the user the ability to engage with the tap of a button. Use the multiple choice response but only design one button, in this case “Sign Me Up”. Save the user’s answer to a custom attribute that you save to user’s profiles. It’s though this attribute that you can create a custom audience for Facebook Messenger marketing to send follow-up messaging. 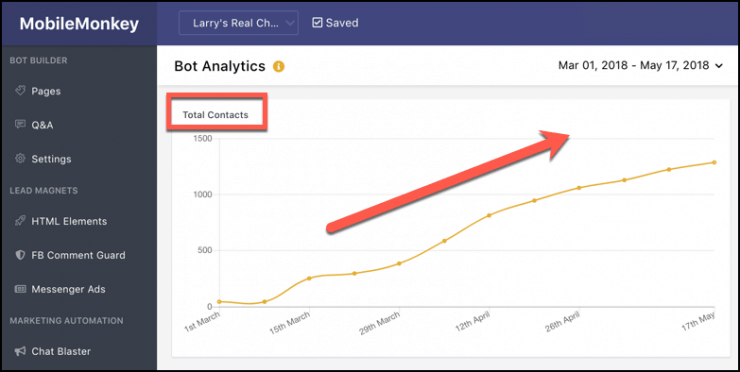 Providing only a single option helps you increase your chances of collecting leads because it reduces the choices in your Messenger funnel. A low barrier to engagement improves the button-tap conversion rate. Keep the text simple and offer-focused. Make it valuable and worth their time! Once you’ve done this, it’s time to paste the code for your new bot into the Facebook ad campaign we’re building. Hit the “Confirm” button and your ad is ready to go live. See how it all comes together in the real-life ad on Facebook. 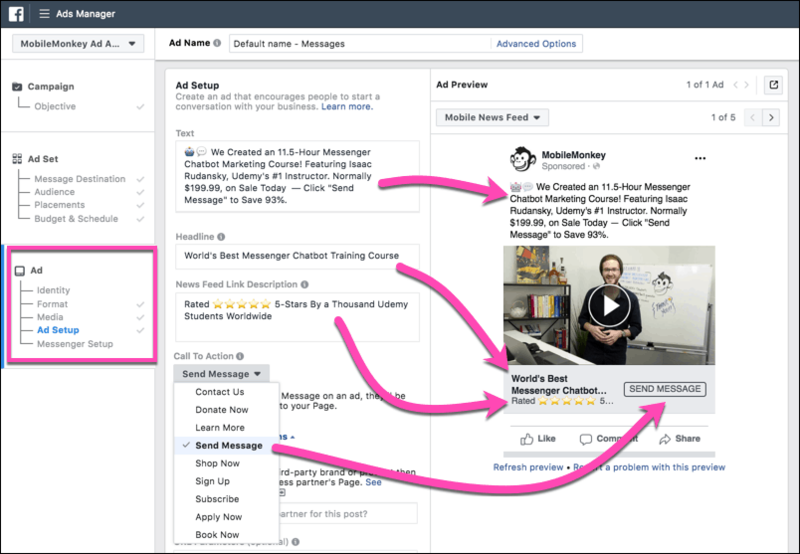 I bet you’re no longer wondering “What are Facebook Messenger ads?” and instead you’ve got some strategizing to do! With the chatbot at the helm, your lead-gen is capable of scaling with budget and demand. It’s collecting new contacts interested in your offer, people you can send follow-up messaging too in the future. Traditional Facebook ads sending website traffic or with the aim of Facebook engagement got a return on investment 5 years ago, but the effectiveness has been falling. Today the opportunity is in getting new leads through Facebook Messenger where competition is low and cost per results is best of class in digital ads. If this post was helpful, then your mind is about to be blown. Check out the new MobileMonkey video training by Isaac Rudansky, chatbot marketing genius and bestselling Udemy instructor. Great question, Said. I do the Messenger ads for MobileMonkey and I think anyone can do it if they know how, and it’s pretty easy actually. Isaac Rudansky’s course will show you how and it’s less than $20 or so. 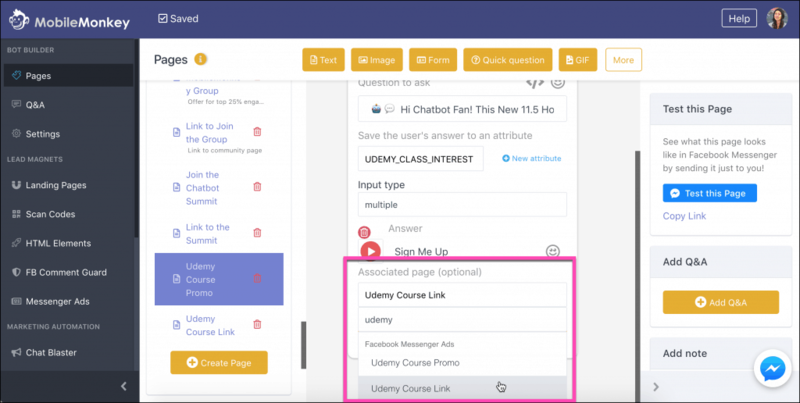 Check it out: https://mobilemonkey.com/chatbot-marketing-course. Where have you been all my life? haha! This is incredible!